At a Catholic church in Charlotte, a generous group makes sure everyone has a place at the Christmas table. Two years ago, Greg Yeager found himself without his wife at Christmas. He was at home in Charlotte; she was serving her country thousands of miles away. Yeager could’ve felt sorry for himself. He could’ve spent the day pouting. Instead, he woke up early, drove for an hour in the pouring rain, and played his bass fiddle at The Cathedral of St. Patrick’s Christmas dinner. 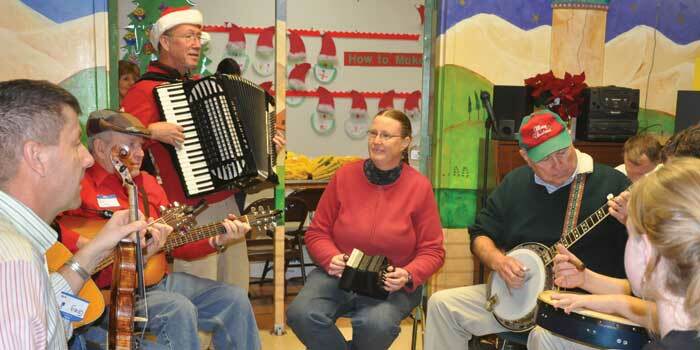 Yeager played for a cafeteria full of guests who came to the Catholic bishop’s base of the Charlotte Diocese. The attendants included people from city housing and shelters, and anyone else looking for a hot meal, company, and musical entertainment. When his wife, Carol, left for the Middle East, Yeager found comfort in music, so he decided to share that feeling with others who could use a little lift. The dinner is a project of The Cathedral of St. Patrick. Pete Brehmer, who has organized the event since 1980, spends a great deal of the holiday season coordinating about 900 volunteers. Many repeat dinner guests request a ride rather than a meal delivery, so they can get the full Christmas experience, complete with music. Last year, six large buses and one minibus made rounds picking up people and dropping them off until about 2 p.m. In the late 1970s, parishioner Bob Wilusz replaced the stereo used at the dinner with his accordion; and in 1980, he recruited the Charlotte Folk Society after he joined the organization. Today, the talent that comes out during these holiday-music jam sessions amazes him. Yeager enjoyed his experience so much that when Carol was back at home for Christmas last year, he convinced her and their two children, Abigail and Sam, to join him at the dinner. At the gift area, Carol used her Spanish speaking skills, and Abigail matched dinner guests with donated clothing and accessories from outside groups, such as the confirmation class at nearby St. Gabriel Catholic Church and students from Marvin Ridge High School. Yeager and Sam contributed a guitar, bodram (a Celtic drum), and Sam’s new mandolin to the compact circle of about 10 musicians. In the adjoining school’s cafeteria, volunteers weaved around the musicians; placed chairs under tables with alternating red and green tablecloths; and sat turkey and dessert plates on marker-decorated, paper placemats. Despite the commotion, the circle of musicians with their old-time instruments captured the dinner guests’ attention. Familiar tunes, such as “Rudolph the Red-Nosed Reindeer,” “Feliz Navidad,” and “O Come, All Ye Faithful” offered a familiar, joyful feeling. Since 1982, members of the Charlotte Folk Society (CFS) have been pickin’ guitars, hummin’ old-time tunes, and jammin’ in song circles against the metallic skyline of the largest city in the state. A collective of preservationists and purveyors of folk traditions, CFS is an organization where Charlotte residents share and enjoy traditional and contemporary folk music, dance, crafts, and lore. It all began when square dancer and guitarist Marilyn Price met Wayne Erbsen, a banjo picker. Both shared a love of traditional folk music and wanted to find others who did, too. CFS now holds regular, monthly meetings where anyone is welcome to attend free of charge. Averaging 400 people each month, these meetings include an hourlong concert; food; and the opportunity to mingle amid multiple genres, such as bluegrass, old-time, Celtic, black string band, gospel, Native American, and folk ballads. CFS also unearths and hires regional performers, offers classes and workshops taught by CFS members, and collaborates with other Charlotte organizations to find more ways to connect with the community. CFS meets on the second Friday of each month at the Great Aunt Stella Center, located at 926 Elizabeth Avenue in Charlotte. Doors open at 7 p.m., and concerts begin at 7:30 p.m. Admission is free, and donations are appreciated. Elizabeth Lilly is a freelance writer who covers music and lifestyle. The North Wilkesboro native now lives in New York City. Editor’s Note: This story contains a correction from the version that appeared in print. The original story said the dinner is a project of the Charlotte Folk Society, when it is actually a project of The Cathedral of St. Patrick.